I’m finally getting around to posting about the Dish Rag Tag box. Yeah I know it’s a little late but hey it’s better late than never. As team captain I received the box 1st. It arrived on Saturday August 4th. Inside of course was the Dish Cloth, 2 skiens of Peaches -n- Cream cotton and a recipe for Yummy Shortbread and finnally two heart shaped cookie cutters. Thanks bunches Emily. I knit furiously on Sunday so my dish cloth would be ready to be on it’s way to my next team member Karen in VA on Monday the 6th. 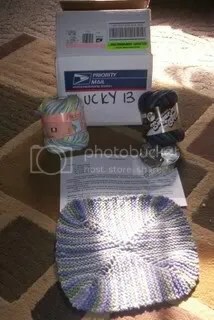 Unfortunately I forgot to get a picture of the dish cloth I knit before I sent the box on it’s way. This has been a fun swap and race and even if we don’t win I have had fun doing it and keeping track of the boxes progress. It is now on it’s way to Aleta (aka Ally B). Through this swap I have met some pretty awesome Ladies. Rock on Lucky 13.